I read this article and found it very interesting, thought it might be something for you. The article is called Q & A: What About Silly Notebooking Pages? 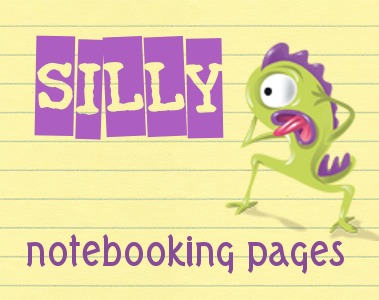 and is located at https://notebookingfairy.com/silly-notebooking-pages/. Our most successful notebook pages are for history, but I have a boy who always wants to make his pictures “silly” which I find very distracting to the history content. So far, I have let him enjoy himself, but for 5th grade next year, I’m wondering if I should require more serious illustrations? For this reason, I haven’t been fully satisfied with notebooking although I want to keep trying. So the problem here is how to handle silly illustrations on history notebooking pages. Without seeing the actual pages, it’s hard to know exactly how I would personally react. Humor is a great way to make our work more enjoyable, and history certainly has its share of funny situations. Being silly is a great motivator. Thinking of silly ways to illustrate a notebooking page can be a chance for great creativity. Some parts of history are too serious to be handled in a trivial manner. A silly approach to history may be a symptom of emotional immaturity and a lack of understanding of the deeper issues. I think that the bottom line for me would be if the silly-factor demonstrated an understanding of the material. There is bathroom humor silly that has no place on a history notebooking page. And then there is a cartoon style silliness that points out the ironies and absurdities of history while demonstrating a keen understanding of the events. I think of the Horrible Histories series that is very silly but is also very informative. Humor is the vehicle for teaching in that case. Maybe you can compromise with your son. Insist on a serious illustration for the notebooking page, but allow for a small, silly comment somewhere to the side or in a corner, just enough to satisfy his craving for laughter but sill giving history the attention it is due. I’d love to hear from my readers on this topic. How much silliness do you allow on history notebooking pages? Q & A: For What Subjects is Notebooking Most Beneficial? Q & A: How Many Notebooks? Q & A: How Can You Use Notebooking for Math? Q & A: Should I Correct Errors on Notebooking Pages? Q & A: How Much Time Should Notebooking Take? Q & A: What Curriculums Include Notebooking? Q & A: Did Charlotte Mason Espouse Notebooking? My 8 year old has a penchant for puns and wordplay. This often comes out in his drawings, too. I think he has a great future as a political cartoonist ahead of him! (If he can just learn to spell…) I draw the line at disrespect for what I’m trying to teach him, but if he shows an understanding of events, I don’t mind if something is drawn humorously. I completely agree with Cindy above! My son is now 13 and has always been quite humorous with his drawings on his notebooking pages. I’ve allowed it for a few reasons: 1. The information that he writes on his pages has shown that he understands the lesson and he does not write anything silly. 2. Much like political cartooning, his humor has a point to it and illustrates his understanding of the topic/times. 3. He hasn’t drawn any bathroom humor or anything disrespectful or inappropriate to the lesson. 4. It’s his favorite part of the notebooking process! We just encountered this! My son (7) was notebooking about Gershwin and drew a picture of him that was a cartoon – I was a little upset with him, because I had intended for him to cut out a picture and paste it in. Well, he explained to me that he was cartooning like when we played “Pick and Draw” and that he was trying to make a caricature (like in a book of famous musicians we had read a few days earlier). Sometimes I think you need to ASK your child to explain the silliness. I’m glad I have the time to delve into my children’s though process in this regard. I think a lot of it would just be discounted in school. My son often draws silly pictures, but since his goofy guys are re-enacting an exaggerated version of real events, I’ll allow it. However, when a picture of an air-plane launching missiles showed up on his page about Horatious defending the bridge against the Etruscans, that was enough. 😛 I only allow silly if it has to do with the story, but silly is not allowed to re-write history. I’m really glad to see this addressed b/c my 13-year-old gets too “cute,” in my opinion, in some of her notebooking pages. For example, today she did a page for an election book (SEE HOW THEY RUN, by Goodman & Smith – excellent book, by the way (-; ) and ended it with, “Goodnight everybody & drive safe (-; ,” complete with the winking face. Also, from about the middle of the page to the end, her comments became increasingly vague then turned into her opinion on our current president. It seems like she starts-out well but then doesn’t feel like keeping it up & gets lazy and off-track. I’ve told her countless times to not be smart alecky in school work, but she doesn’t always heed my advice (obviously). Does anyone have any ideas on how to handle this since we’re not really supposed to grade notebooking pages? She does this in every subject in which she needs to write more than a one-word answer, and even then sometimes she does it! We are a laid-back family who likes to kid around a lot but not to the degree she is taking it in her schoolwork. Her older sisters who are in high school and college are excellent role models and don’t do it, so I’m really at a loss as to why she won’t listen to me and what I should do about it. We could stick to dry worksheets & textbooks, but she does it with those, too. Any help would be greatly appreciated! Thank you for your reply! As for comparing her to my older girls, I only mentioned that in case anyone reading my reply thought that she got the idea of being silly from seeing her siblings do it. Aside from that, I don’t compare her to them. She has done better as the school year progresses. It became apparent that she was using too much of our vernacular in her schoolwork b/c she was around the house 24/7, and that was just what she was used to. The more she socialized with others her own age, the less it happened.